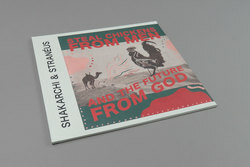 Shakarchi & Straneus - Steal Chickens From Men And The Future From God. Vinyl LP. Bleep. While Steal Chickens From Men And The Future From God might be the first LP from Gothenburg duo Shakarchi & Straneus, the pair’s discography spans the full length of the 2010s. When coupled with the fact that this album is reaching the world via the pair’s old friends at Studio Barnhus, the record’s feeling of ease and familiarity begins to make more sense. 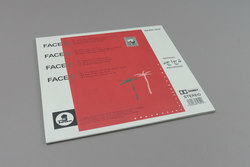 Clearly well-attuned to each other’s methods at this point, Shakarchi & Straneus have crafted a sparky, globalist LP that brings the influences thick and fast. 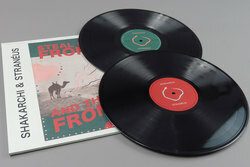 Balearic house, filter house, hi-life disco, dub, plunderphonics and more are all thrown into the melting pot of this fun, zany record. Imagine The Avalanches with more dancefloor intent.